Focusing on the Battles of Lemberg and Tannenberg, David Porter analyses the clash of empires in the east at the beginning of World War I – a vast war of movement that saw Russia taking on Germany and Austria-Hungary in the marshes of the Masurian Lakes and the foothills of the Carpathian Mountains. Matt Phillips argues that, despite the triumph of the English longbow, Sluys did not mark the beginning of English maritime supremacy. Kesselring – Great commander or war criminal? Andrew Sangster investigates black marks on the wartime record of WWII German general Albert Kesselring. John Sadler revisits the the murderous British assault on the heavily defended Fort Ticonderoga in 1758. The First World War on the Western Front can be divided into four main phases: a war of movement in the summer and autumn of 1914; a war of trench stalemate through 1915; a succession of failed great offensives to break that stalemate in 1916 and 1917; and a renewed war of movement in 1918. The sequence on the Eastern Front was radically different. It involved a see-saw struggle between three rival empires – German, Russian, and Austro-Hungarian – for control of the huge contested spaces of Eastern Europe. Offensives frequently broke through. Sometimes the victors advanced 100, 200, even 300 miles. But then they would lose momentum as they advanced ever further from their bases of supply in a region with few railways. Because the relationship between mass and space was different, a war of movement continued in the East between periods of trench-war stasis. Yet the war was no less murderous than on the Western Front. The size of modern armies and the killing-power of modern weaponry ensured that offensives involved massive casualties. In our special feature this issue, David Porter analyses the two critical opening battles of WWI on the Eastern Front: Tannenberg and Lemberg/Przemyśl. 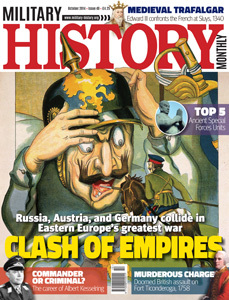 Also in this issue, historian Matt Phillips analyses the English naval victory at the Battle of Sluys in 1340, John Sadler recalls the doomed Black Watch assault on the French fortress of Ticonderoga in 1758, while Andrew Sangster discusses the controversial career of Field-Marshal Albert Kesselring – for some, one of Germany’s greatest WWII commanders; for others, an accomplice in Nazi atrocities.